Save time and resources by reducing manual data entry and eliminating redundant operations. Processing time can be reduced from weeks to a matter of days. Reduce the level of manual interaction to a minimum thanks to automatic data extraction and system-based approval workflows. Eliminate the problem of misplaced, mishandled or forgotten invoices. Optimise cash flow management by monitoring and paying all incoming supplier invoices at the best time. Take full advantage of early payment discounts. Download our white paper to discover how automation projects can be successful and how to measure the ROI of the solution. Download our white paper and discover the advantages of intelligent capture solutions and find out how they can significantly improve your AP processes. This white paper describes how to streamline invoice processing by leveraging data capture. Learn about the benefits of automated processing. Read how to address the challenges of invoice processing by minimising manual work, to make the AP process leaner and improve your supplier relations. ABBYY's solution is comprised of the following key components: multi-channel invoice collection, automated invoice reading and review, straight-through-processing (PO matching and automated checks) and exception handling (manual review). High-quality recognition of invoice data with a regulation framework ensures the invoice's compliance with the respective country of origin's regulations. Best Practice release workflows allow the routing of invoices in order to make them available to the responsible person. Cost savings from eliminating the costs for postage, envelopes and shipping from the supplier. Manual steps are no longer necessary, because invoices do not have to be opened and digitised. Invoices are sent directly to the invoice processing workflow. Invoices can be archived directly at the time of receipt. An initiative of the European Union will allow companies to send electronic invoices without a signature starting in 2014. The advantages for both the supplier and the invoice recipient are clear: cost saving from eliminating manual steps. ABBYY's solution enables companies to automatically process incoming electronic invoices. Email inboxes based on Microsoft Exchange or other email formats receiving invoices in digital format can be monitored automatically. The email attachment, usually an unsigned PDF file, is reviewed and transferred to the OCR recognition stage of the ABBYY solution. Invoices, whether paper or electronic, can be sent and processed in one single invoice workflow. 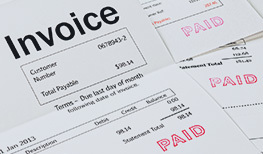 The incoming electronic invoice is reviewed with the same system that is used for a scanned paper invoice. In case of an error, the invoice is placed in a special queue and will be processed separately. The electronic invoice will be stored alongside the original email in an archive and is thus available and securely stored for later review. Shared Services Centre of the global logistics service company Rhenus capture invoices and other documents with ABBYY solution. Adactus Housing, reduces the costs and time-consuming manual data entry in invoice processing with ABBYY FlexiCapture solution. Learn more about ABBYY products that power ABBYY accounts payable solution.